Classes can be entered here, which are used at runtime in order to create objects that perform web service requests among other things. 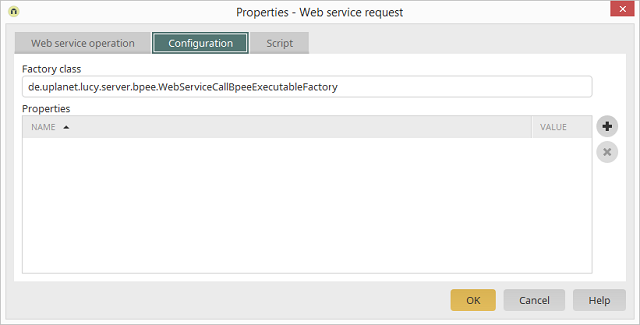 This mechanism will be used, for example, with the registered class "de.uplanet.lucy.server.bpee.IntrexxLoginWebServiceCallBpeeExecutableFactory" to perform an Intrexx login via web service. This class performs two requests in sequence for the Intrexx login operation without making this process visible to the user. Factories can be made into parameters, for example with timeout values for the creation of a connection and server reply. Displays the name of the parameter. If you click on a cell in this column, you can either select an Intrexx parameter or enter a custom parameter directly. The parameter value can be edited here.